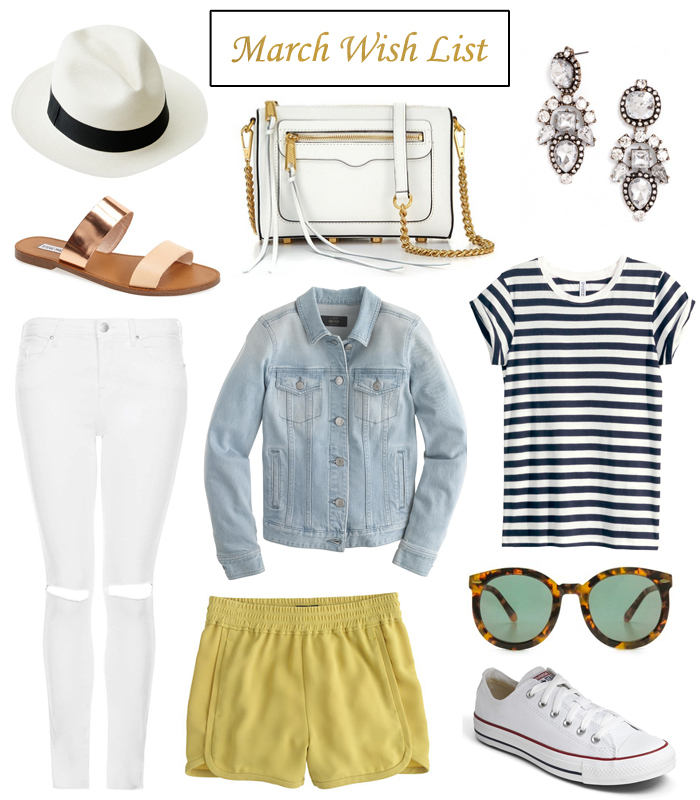 This month's wish list is all about what I'm craving for spring - clean, simple, light + timeless! We have a quick getaway to somewhere in the south coming up in a month, so I'm already thinking ahead about comfy-cute pieces that will be easy to layer and travel with. The spring transition is always interesting (but fun!) and my favorite tip is to start wearing lighter colors (white, blush, gray), even if you're still having to layer for cooler temps. I shopped the Old Navy/Gap sale over the weekend and picked up this denim jacket, this striped shift dress, and these spring-y sweaters here and here (in 'primitive'). I'm definitely going to order Converse for our trip, but have completely fallen in love with these metallic slide sandals and want to buy them ASAP! I'm loving distressed denim at the moment (right along with everybody else) and this white pair is calling my name, plus I think I need that straw panama hat for some shade on our trip. And last but not least, the Karen Walker Super Dupers that I've been in love with for ages + this Rebecca Minkoff crossbody are both on sale right now, so I'm thinking of splurging! Today is also the start of the ShopBop sale that runs through this Saturday! Depending on how much you spend, you can get 15-25% off your order with the code 'BIGEVENT15, so it's a great time to buy any investment pieces you've been eying. Some of my favorites included in the sale are Ray-Bans (want these), Karen Walkers (probably going to buy the pair above), and Tory Burch and Rebecca Minkoff bags.